The WebSphere® 6.1 Feature pack for Web services offers a new and improved implementation of Java Web services and improved usability. Some of the changes simplify existing solutions; others enable new solutions requiring more secure and reliable services, asynchronous interaction patterns, and more complex data models. The Feature pack for Web services offers a preliminary implementation of the WS-I Reliable and Secure WS-I profile, which is expected to proceed to ratification through 2008. 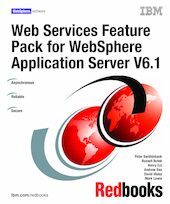 This IBM® Redbooks® publication includes an extensive interoperability example using Reliable and Secure Web services with the Windows Communications Foundation. There are also lots of examples showing you how to use the feature pack, use the new Web services Policy sets, and code Java Web services using the JAX-WS specification. For architects and designers, there are chapters on business scenarios that will benefit from the feature pack, and examples of patterns that are readily implemented using the feature pack.